Specialized sampler implementation used to seed MLT-style algorithm. Allows to query for the current sample index, which can later be used to rewind back to this state. In the case of MLT, this makes it possible to sample paths approximately proportional to their contribution without actually having to store millions of path. Note that `rewinding' is naive – it just resets & regenerates the whole random number sequence, which might be slow. Advance to the next sample. Create a clone of this sampler. The clone is allowed to be different to some extent, e.g. a pseudorandom generator should be based on a different random seed compared to the original. All other parameters, are copied exactly. Return the underlying random number generator. Retrieve the next component value from the current sample. Retrieve the next two component values from the current sample. Same as request2DArray(), but in 1D. Request that a 2D array will be made available for later consumption by next2DArray(). This function must be called before generate(). See next2DArray() for a more detailed description of this feature. Serialize this sampler to disk. 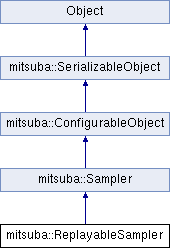 Manually set the current sample index.